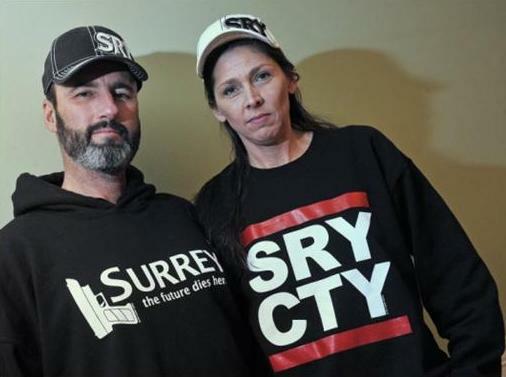 The rumors have been confirmed about the City of Surrey sending a legal cease and desist threat to our Friend at Surrey Shirts. They claimed that their shirt Surrey: The Future dies here was an infringement on their copyright not. Their cease and desist threat from a lawyer is just another documented case of their bullying. I was cautious about the shirt with the City logo saying Better safe than Surrey. Yet this other article is quite right in that “Copyrighted material is, of course, protected by law. But so too in Canada are parody and satire of copyrighted material.” Evidently City Hall’s lawyer is back tracking and said they aren’t going to pursue the matter in court they just send a legal letter. So why send the letter? To be bullies and try and scare the sole proprietor knowing they don’t have a real case in court. I find it highly ironic and highly offensive Surrey First is promoting the No Bullies day when they themselves are the biggest bullies in the city. So get your red hot satirical shirts from Surrey shirts dot com. No kidding. This isn’t about risky investments. It’s about conflict of interest. Their sole purpose is to make money and they are the ones making decisions on flipping agricultural land into commercial. Like the Gateway Casino proposal and just like Campbell Heights Industrial Park. You're damned right it's not, it's about outright THEFT of public property and resources. And what do these people really have to fear? Nothing really, if Gordon Campbell can get away with stealing B.C. Hydro, what's a few acres of land? Yeah, BC Hydro - that is still a huge unresolved concern. Privatizing half of BC Hydo and having the private part sell power to the public part at over inflated prices has created that ballooning deficit tax payers will eventually have to cover. That was grand theft in every sense of the term. Gordon Campbell should be in jail. Not partying with a chauffer in London thanks to Stephen Harper.